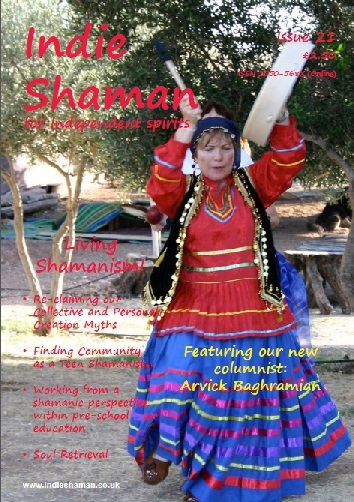 Arvick has recently started contributing a series of articles as featured columnist in the magazine Indie Shaman. This is the first in the series. Today I’d like to talk to you about the subject of ‘we journey how we live’. This is a discovery of mine. Over the years I’ve worked with people from all walks of life. They come for shamanic counselling to work with their issues, whether its personal growth or healing or whatever they feel is lacking in their life. And one of the things I’ve discovered is that how they communicate in their ordinary reality manifests itself during the journey. For example, if someone has authority issues, or a problem with confrontation, or they lack confidence in speaking clearly, any form of communication issue that they may have, becomes augmented during the journey. An example that was quite enlightening and surprising for me was a particular lady who came to work with me shamanically. You would never have thought that she had any communication problems. She was very, very articulate. She appeared very confident and explained herself very clearly. But when she went on her first journey, she was reduced to the state of a frightened child. She could barely speak or ask any of the questions that she needed to ask. She came back from the journey and we listened to the tape of it in order to make sense of it. I asked her a few times ‘what stopped you from asking the teacher these questions, more deeply?’ and she said ‘but this is how I am in my life! When I am faced with authority figures I totally lose myself. I become a frightened child. So when I go to the doctor my husband always goes with me and asks the questions for me because I just sit there. I freeze’. Through working with me and through the journeys she was able to resolve that issue. One of the main journeys was to go and ask the spirits what was the reason, where was the fear of authority coming from. And that was a huge help. And then gradually she started improving her communication during the journey, asking better questions, deeper questions. And what she noticed and later fed back to me was ‘do you know, in life I am changing as well, and I’m much better at confronting authority figures and talk to them as if I am talking to my friends or my husband’. And of the issues that she worked on with me, this, for her, was the most important result. Over the years I’ve read every book that comes out about the subject of shamanism, because I love this subject very much. And I have never come across this aspect. No-one has mentioned it. And although through journeying we grow and we heal and our quality of our life improves, somehow this is one of the aspects that I find most helpful. People actually becoming aware that the way they live comes out in their journey and they are able to heal that in their ordinary reality. Don’t forget to subscribe to Indie Shaman for all of Arvick Baghramian’s articles and many other fascinating features.